There’s no getting around the striking resemblance between Netflix’s latest release, THE SILENCE, and last year’s surprise hit A QUIET PLACE. Despite how quick you may be to label THE SILENCE as a QUIET PLACE knockoff, it should be noted that THE SILENCE is based on the 2015 novel written by Tim Lebbon, while A QUIET PLACE is based on a spec script John Krasinski encountered in 2016. According to A QUIET PLACE screenwriters Scott Beck and Bryan Woods, the origins of their story date back to their college years of studying silent film, supposedly around 2012. It’s all a bit hazy, so you can decide for yourself. Finger pointing aside, THE SILENCE remains an eternally intense, gripping and brutal horror thriller. It may not have the subtlety or mystery of Krasinski’s film, but it has smart characters you care about, savage situations and a grounded sense of realism within its supernatural tale. Adapted by Carey and Shane Van Dyke (CHERNOBYL DIARIES) and directed by John R. Leonetti (ANNABELLE), THE SILENCE opens with a group of cave divers deep within the Appalachian Mountains. It’s uncharted territory that will put them in the history books, but how it will read won’t be as triumphant as they had hoped. We soon see that their archeological expedition uncovers an ancient species known as Vesps. They are vicious, demonic bat-looking creatures that will reduce you to scraps if you make the slightest peep. Following that cold open, we meet Ally Andrews (Kiernan Shipka, best known as Sally Draper in Mad Men and Sabrina Spellman in Netflix’s THE CHILLING ADVENTURES OF SABRINA), a 16-year-old who lost her hearing three years ago in a car crash that killed her grandparents. Kids at school mock and ridicule her, but she finds comforts in her walks home accompanied by the handsome Rob (Dempsey Bryk of BLACK MIRROR). Ally’s mother, Kelly (Miranda Otto, also of THE CHILLING ADVENTURES OF SABRINA), and grandmother, Lynn (Kate Trotter of Covert Affairs), tease her about the boy’s affection for her, while Ally’s father, Hugh (Stanley Tucci), and younger brother, Jude (Kyle Breitkopf), also sneak in a few jabs. They encapsulate a perfectly loving family. Then, chaos unleashes when these terrifying creatures spread across the globe like a fast-acting virus. The Andrews family seeks refuge and encounter a series of unfortunate events that ends with them crossing paths with a sinister cult. They want to exploit Ally for her heightened senses that prove useful during these dangerous circumstances. 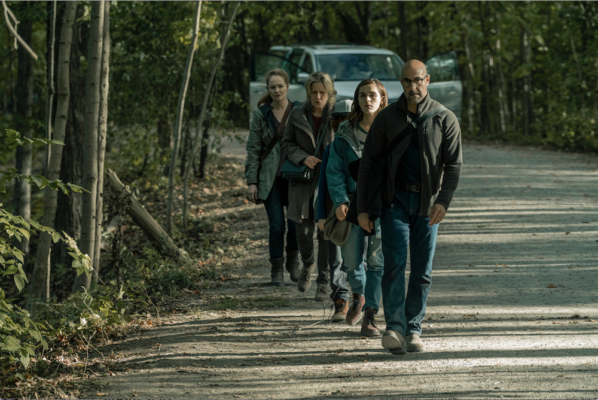 L-R: Miranda Otto, Kate Trotter, Kyle Breitkopf (hidden), Kiernan Shipka and Stanley Tucci star as the Andews family in ‘THE SILENCE.’ Courtesy of Netflix. It’s unfair to compare THE SILENCE to A QUIET PLACE, but it’s tough not to when so many moments align. However, The Silence manages to find effective ways to build its intensity to make it its own unique drama-filled creature feature. The Vesps are entirely out in the open. We know exactly where they came from and where all they’ve attacked. In some of the earlier scenes when the Vesps make their debut to the world, THE SILENCE is incredibly dark. One scene shows a mother trying to comfort her screaming child in a subway train, when all of a sudden, a man removes the child from the mother’s arms in an attempt to toss the infant outside. This heartbreak continues in another scene involving the family dog. So, naturally, if you have wee ones and/or pets, you may want to watch this film with them close by, so you can take five for a hug break. Leonetti also creates a slow and steady pace that makes it easy to get on board. There’s a smooth progression as we move from one attack sequence to the next. No two attacks echo each other, either. Each one, whether it’s being stuck inside a car like THE MIST or racing to get through a tunnel with the Vesps nipping at their heels, finds different ways to terrify. 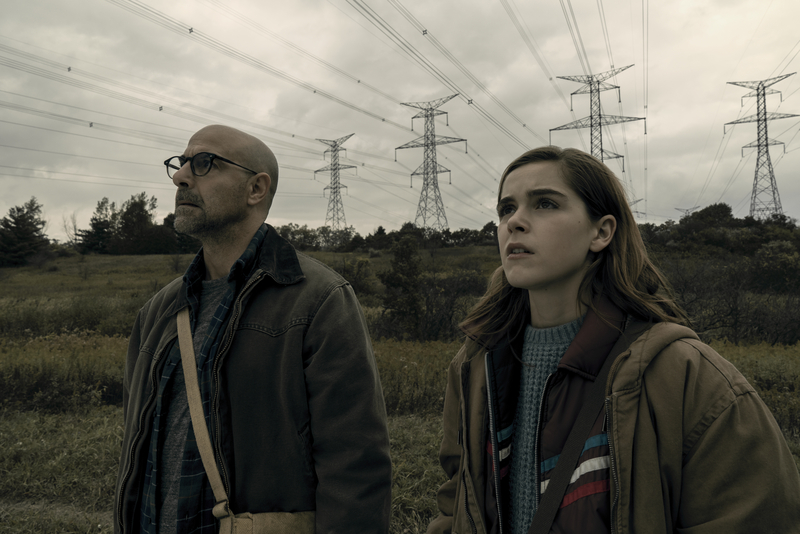 I also found myself quite moved by the performances and the level of humanity each actor brought to their roles, with Tucci and Shipka being the primary targets. The father-daughter bond rings true, and the fatherly love displayed by Tucci strikes all the right emotional chords. There’s one hilariously awesome scene where Tucci’s Hugh fires up a wood chipper when his family is in peril, and let’s just say the results paint the floor red. The cult provides some flavor, too. Although, it admittedly feels a bit tacked on and not explored well enough to warrant its effort to overpower the threat already at hand with the Vesps. That said, the creep factor is evident through the uncomfortable stares from the cult leader, the Reverend (Billy MacLellan of MAUDIE). He has a Charles Manson-like vibe to him that gets underneath the skin, and it comes to full fruition when he flashes his tongueless mouth and jots disturbing messages in his sacred notepad. THE SILENCE may have lost the race to the screen to make a profound impact with its originality, but there are enough whispers of creative intensity and tender performances sprinkled throughout to give it flight. If they had gutted Ally’s on-the-nose narration and introduced some more subtlety, we’d have a real winner on our hands. But it’ll make you sweat. 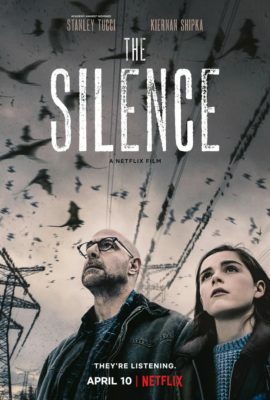 THE SILENCE is available on Netflix today.